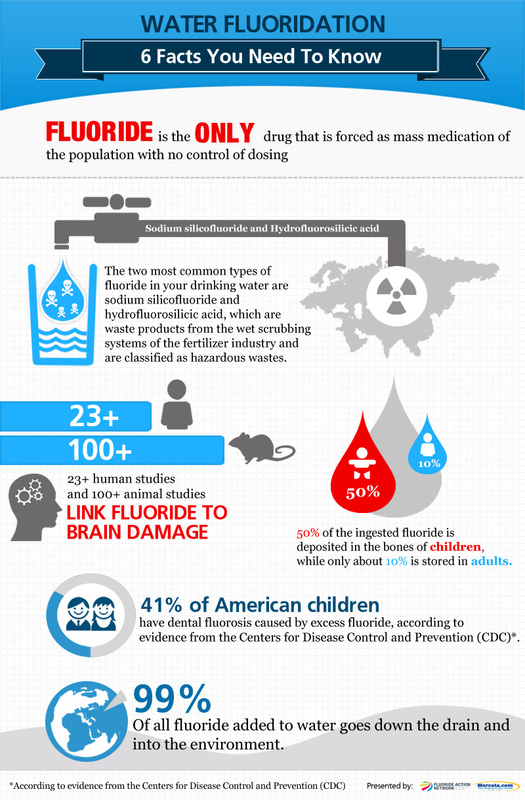 Home→Science→Medical→Water Fluoridation→Water Fluoridation – What Are The Real Benefits? Water Fluoridation – What Are The Real Benefits? As most people in the west I grew up in the belief that fluoride is good for your teeth and strengthens them, so I got the fluoride tablets as a child and used regularly fluoridated tooth paste for quite a while. But it has not prevented my dentist to fill all my back/molar teeth when I was a child. And as I now belief mainly for money making reasons, because I had never problems with my teeth for more than 30 years, except with the fillings themselves of course. Well my teeth are very strong so this might have been attributed to my care, which is not to particular, or I got them from my Grandfather who had very good teeth all his life until he died aged 96. So I actually started out as a fluoride user, because that is what dentists and mainstream media made me belief. But since I came across information stating that fluoride is a toxin and that it has teeth, bone and brain damaging effects. Simply because fluoride is a highly toxic waste by-product of the Aluminium and Petroleum Fertilizer industry. And I also came to know that corporate s like these always look for ways to make money, even with toxins as my extensive research into many other areas showed. Historically water fluoridation was used first by the Nazi’s in their concentration camps since they found out it makes consumers lethargic and more easy to control in this way. So most countries in the world have learned from that and banned the use of fluoride in the water supply. But from what we can observe it is still used nowadays, mainly in English speaking countries, i.e. US, Canada, GB, Australia, New Zealand. In those and many other countries the medical profession claims that fluoride will help to strengthen teeth and combat caries which is endemic especially in poor neighbourhoods. But that this might have something to do with poor diet, does not come to their mind. The overuse of processed sugary foods is known to create high acidic levels in the mouth and therefore caries. Well the uncontrolled mass medication via water fluoridation, where 99% of the applied fluoride does not even reach the teeth. It is either ingested or thrown with the waste-water costing communities millions of dollars and the studies done on efficacy showed if anything very little improvements and was comparing apples with pears, taking figures from an un-fluoridated area with a fluoridated one, without providing a detailed evaluation about the standard of living, teeth cleaning regiments, etc. Mainly referring to studies done by the industry itself which can be absolutely trusted since they do not have any interests in selling their products and services, right. So no real evidence for the efficacy of fluoride just what the “authorities” claim. Yet again there are scientific specialists and victims of fluoridation showing en mass that these claims are false. And who really benefits from that, well as usual the medical profession which has to deal with the symptoms and problems created by this practice, i.e. fluorosis of teeth and bones, cancer, dementia in various forms. Then the Aluminium and Fertilizer Industry can convert their highly toxic by-product into gold. And of course the ultimate authority which is the government and its bodies which claim to improve health but actually dumb down the population making governing/controlling so much more easy, a real win-win. Yet why would people do such things to other people, its because they are ignorant and/or money/power minded. And its generally not anybodies fault, we are all socialized into beliefs which are all based on a centralist/pyramid system, were major decisions are made top down, excluding unwanted results and are mainly based on egocentric power/money driven mind sets. That simply means everybody follows and beliefs an authority and stops thinking and acting responsibly for themselves. Yes I have been one of them out of unawareness, but that has changed since my knowledge changed. I strongly feel that we are not on the right track serving ourselves and planet earth, since it has come to a level of corruption and abuse that is mind-boggling as more and more evidence appears in all levels of society. I just wonder why is it mostly used in English speaking countries and others do not practice this kind of “care”. Are other countries and their scientists illiterate or are they just more intelligent. Medical grade fluoride provides only minimal advantage, of only half a tooth surface, does this justify mass medication and poisoning of people being practised as a means to improve tooth health. Again they do not use medical grade fluoride they use a toxic waste product (hydrofluorosilicic acid or sodiumsilicofluoride) which is proven to be a neuro-toxin, even in those “small” amounts. So who would benefit from those “side effects”, its the dentists who get to treat fluorodontosis, the doctors who get to deal with all sorts of extra diseases created by the toxin and the government which gets a subdued and dumbed down populous which makes control of the masses much easier. You really need to develop a healthy self-awareness to protect yourself and your loved ones from those many outdated and dangerous beliefs.